I have been loving Assam tea since my Boston restaurant days. One of my servers took a trip to England and brought me back a box of Harvey Nichols Assam tea. It has been stocked in my pantry ever since. Assam tea is a black tea harvested in the foothills of the Himalayas in Assam India. Irish Breakfast tea is typically made from a blend of Assam and Ceylon teas. Like most black teas, Assam lends itself to milk and sugar. It offers a pleasant malty flavor and a gorgeous caramel color. It is a perfect morning tea. 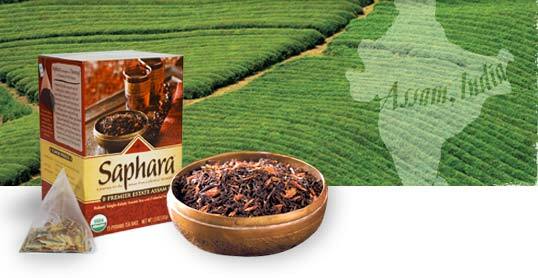 I found this Saphara brand Assam at my local grocer and it is quite good. It is both USDA Organic and Fair Trade Certified.